When I first had my Chase Freedom card years ago, I thought only the 5% rotational category rebate was useful, and redeemed the Ultimate Reward points for cash-back. Later, ebates.com, Topcashback.com has emerged, and they constantly offer higher cash-rebate for online purchases. It was not until 2012 when I started to travel for vacation more, I realized some unique benefits of Chase Ultimate Reward points. If you are not sure to earn cash-back or miles/points for vacation travel, just earn and accumulate Chase Ultimate Rewards (UR) points for now. Once you decide to redeem miles/points for flight ticket or hotel stays, apply Chase Sapphire Preferred card or Chase Ink Business card with first year annual fee waived to transfer UR points into participating frequent flyer or hotel reward programs. 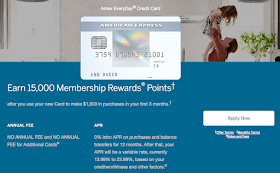 To earn UR points for online purchases, Chase Freedom/Sapphire Preferred/Non-Preferred card holders would make online purchases via Chase Ultimate Reward Mall. Card holders can also earn UR points when making purchases in-store too such as at gas stations, restaurants, Macy's Store. 2X for hotel accommodation using Chase Sapphire Preferred card or Chase Ink card. The concept of "Double-Dip" is to purchase eligible gift cards from Chase Ultimate Reward Mall or office supply stores such as Staples, Office Depot, Office Max, to earn UR points, then use the gift cards to make on-line purchases via Chase Ultimate Reward Mall to earn UR points again. I believe only a small number of merchants honor that. For example, Home Depot. Total earned is 9X UR points per dollar spent. I have seen 5X for Staples.com and 5X for HomeDepot.com in Chase UR Mall, probably once a year. In that case, it would be 15X UR points per dollar spent. Below is the T&C posted during the redirect from Chase UR Mall to Home Depot website. 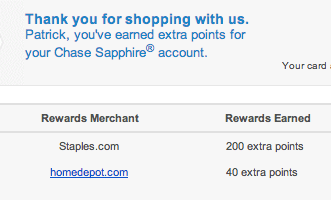 Note that: UR points will not be rewarded if purchasing gift cards from Home Depot. It also does not explicitly exclude giving out UR points for purchases using gift cards. OfficeMax and OfficeDepot are known not to award UR points for gift card purchases. Not eligible on purchases made with coupon or discount codes that are not found on this site. Not eligible on gift cards, gift certificates or any other similar cash equivalents. Any return, exchange or other adjustment made at a physical store location for an on-line purchase may result in your purchase being deemed ineligible for reward. Not eligible on Installation Services and on purchases made with third-party partners where the customer is leaving the homedepot.com web site. Use Chase Freedom card to purchase Macy's gift card in Macy's stores, when it is 5X rotational category, then use the gift card to make purchases in macys.com via Chase UR Mall to earn another 5X UR. Use Chase Ink card to purchase Macy's gift card in office supply stores to earn 5X UR, then use the gift card to make purchases in macys.com via Chase UR Mall to earn another 5X UR. 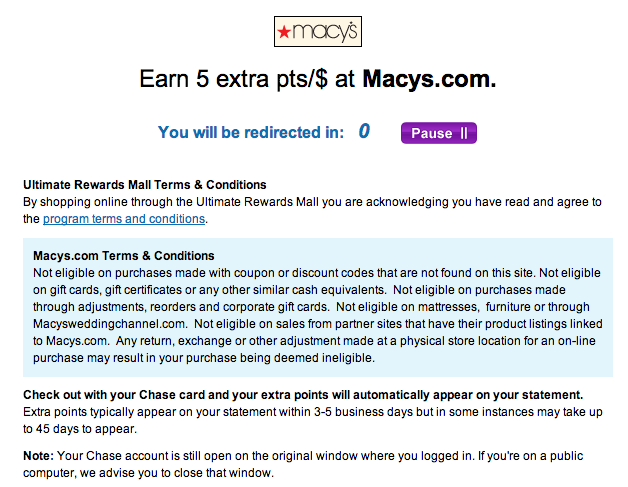 I already tested that purchasing Macy's e-gift card via macys.com redirected from Chase UR Mall does not earn UR points. One one-way non-stop United First-class ticket from San Francisco to Tokyo, Japan requires 80,000 United miles and $2.50. A typical United First-class ticket is priced around $9,000 one way. 80,000 UR points can be redeemed as only $800. You can transfer 80,000 UR points to your own United MileagePlus account via Chase Sapphire Preferred card or Chase Ink card. It may seem not possible to accumulate that many UR points, because it would take a long time to spend $30,000 in credit card purchases, assuming an average of 3X UR per dollar spent. That may be true. Nevertheless, if trying out Business-class or First-class flight would be an attractive experience for you, Ultimate Reward points (in addition to United MileagePlus miles) present an option to enhance your vacation travel experience. This is the main reason why I accumulate UR points. If I change my mind, I can always redeem the UR points as Chase statement credit. Open a Chase Checking account if you do not not have one already. Open a free CreditKarma.com account to start estimating and tracking your credit score. Apply Chase Freedom card if you do not already have one. Make sure you have at least FICO score > 730 before applying for Chase Sapphire Preferred card. The following policy is also important to know. I copied and pasted from Chase Ultimate Reward website after I signed in. Can I transfer my points to someone else's frequent travel account? Are there any restrictions to point transfer? You may transfer as many points as you want in 1,000-point increments to a participating partner's frequent travel program. 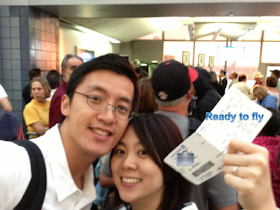 Note: For Korean Air SKYPASS transfers, you can only complete one point transfer transaction per day.